As a solar power development project, we conduct five projects. About construction of an industrial solar power plant, we can consistently respond design, material procurement and construction. As an EPC business, we support total in order that customers can invest solar power with peace of mind. Even when solar power plant investment is done, there are times when you release it for various reasons. For stable renewable energy production, we will respond with expensive purchase and prompt procedures and mediate to those who need it. We will provide high-yield solar power plants that can meet various needs of customers. We are making efforts to support environmental protection by solar power generation with everyone’s help. Some of the reality is that you can not properly operate solar power plants. We believe that we have a responsibility for maintaining the power plant so that we are also focusing on maintenance after operation. For efficient management of solar power plants, it is important to select appropriate materials that meet the conditions. We can offer materials of solar power generation system cheaper than many manufacturers. We also sell our own brand products that stick to cost-effectiveness and quality. We will sensitively catch information of latest technology and procure optimum materials. 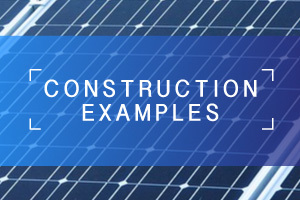 We introduce past solar power plant construction examples.